1. Edgar Wright’s Baby Driver is the sort of movie you have to be careful not to give too much of a home-field advantage to. It’s a sugar missile of endorphins aimed directly at the movie dork’s pleasure center, a film that is so eager to get you on its candy-crush wavelength that resistance doesn’t just seem futile, but downright uncharitable. The movie is a foot-tapping, sing-a-long gas, though, like many a summer movie before it, it’s best if you don’t spend too much time reflecting on its twists and turns, or expect much emotional involvement. This feels like a cinematic love letter to fanboys from a fanboy, and if nothing in it bears much resemblance to normal human activity, hey, what about the movies does? 2. The Baby of the title is Baby (Ansel Elgort), a teenager (I think) who lost his parents in a car accident as a child that has left him with a ringing in his ears, a ringing which requires him to listen to music constantly and, for reasons not much more complicated than “Edgar Wright wants to score car chases to cool songs,” this has turned him into an amazing getaway driver. Baby doesn’t want a life of crime, but accidentally heisting the car of a crime lord named Doc (Kevin Spacey) years before left him in debt to him and in desperate need to pay it off. Baby works himself to One Last Job—he has to be the youngest person to say “just one last job and I’m out” in movie history—but Doc decides he won’t let him leave, making him work by threatening his waitress girlfriend Debora (Lily James). But that last job, thanks to a trio of unpredictable cohorts played by Jamie Foxx, Jon Hamm and Eiza Gonzalez, turns out to be more dangerous than even Baby could have imagined. 3. This is nothing you haven’t seen before—I’ve seen it joked that Baby Driver is sort of a YA Drive—and I suspect Wright’s fully aware of that. This movie is all about sensation, about grooving on the very specific but unquestionably catchy hook Wright has laid down for you. The movie is wall-to-wall music, seemingly taken straight from Wright’s own iPod, and his enthusiasm is infectious, if maybe a bit limiting. 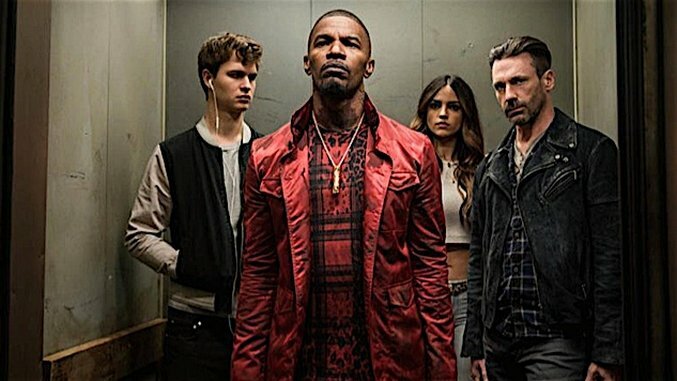 Like Baby, Wright is someone who finds it difficult to function without music, and an argument could be made that if you took away the songs from Baby Driver, the movie’s fundamental gimmick, you might not have all that much at all. Wright’s an energetic director, but I’m not sure he’s a particularly invested one; the movie is constantly shifting tones, like an iPod on shuffle, making it difficult to plant any stakes of emotional involvement. These are simply Fun Dudes, speaking movie language and nothing much else, happy to make a brief escape from Wright’s brain for a couple of hours. You won’t care about much of what happens to anyone in Baby Driver, and I can’t tell if it’s to the movie’s credit or detriment that it never tries all that particularly hard to make you care. 4. This can’t help but lead to the film feeling a little Tarantino Lite at times. Scott Pilgrim vs. the World—still Wright’s best film—wore a lightness on its sleeve, its self-referential and pop-culture-riffing nature a healthy defense against any accusations of being overly precious. But there’s blood, real blood, in Baby Driver, and I’m not sure Wright lays enough of a real-world foundation to feel any of the crunches and the splatter. At its worst, Baby Driver can feel a little Things to Do in a John Hughes Movie When You’re Dead, an odd mashup of quirky/gritty crime thriller and a lively, bubble-gum-colored music video. As menacing as the bad guys are in this, they’re never scary; the movie just isn’t pitched at that sort of level. Foxx is supposed to be playing a psychopath, but like with everything else here, it’s an artful pose. Everyone’s just pretending. (The closest we get to any sort of real character is Jon Hamm’s Buddy, with an intriguing backstory that’s only hinted at, but even that devolves into another toe-tapping action sequence.) This is a movie without a lot at stake—even the love story in Scott Pilgrim had more on the line—which can sometimes leave you a little on the outside looking in, watching Wright tap dance as fast as he can for your enjoyment. 5. But my, what dancing! We’ve all imagined ourselves, while walking down the street listening to the music in our ears at maximum volume, in a private movie of our own creation, and it is quiet the achievement of Wright to have essentially made that movie real. Just because you’re not invested in the story of Baby and his cohorts doesn’t mean you can’t have a blast being a part of it. The movie is chock-full of dazzling set pieces, from an escape before the opening credits to a wild botched heist featuring a hilarious bit of confusion involving Halloween masks to an over-the-top grand finale that maximizes what sort of carnage you can create in a parking garage. (The movie is so convincing that you’ll believe you can actually drive a car faster than 15 miles per hour in downtown Atlanta traffic.) Baby Driver is usually zinging along too fast to grasp onto, but it sure is a joy trying. It’s a like a car we’re the dogs trying to catch. It’s really not worth actually reaching your destination, but that’s okay: The fun is in the chase.